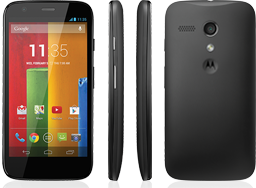 Motorola Moto G is one of the best mid range smartphone. It is not as powerful as the most of the flagship smartphone in terms of the specification but in real time performance is outstanding for the price it is available. The price of Moto G is $179. The Moto G runs on Android Kitkat OS and powered by Dual core processor with 1GB of RAM. In this post let us see how to use the device as modem to connect to PC. This method of using Moto G tethering works with both the editions of Moto G.
Read: moto g 2nd generation pros and cons & Pros and Cons of Moto G .
To use Moto G as modem, you need to first enable the USB tethering. To do this follow the below steps. Step1: Touch to the Apps. Step 3: Tap on to More. Step 4: Go to Tethering & Mobile Hotspot. Step 5: Check the box for USB Tethering. Do note that, if you enabled WiFi or if USB cable is not connected, then USB tethering option will not be enabled. Once the tethering is enabled, Moto G works as a modem to use internet from PC. You can disable USB tethering by unchecking the tethering & Mobile Hotspot. 1. Moto G Tethering works with Windows Vista, Windows 7 and popular linux distributions such as Ubuntu, Fedora etc. 2. Even you can also use Motorola Moto G as WiFi Hotspot to connect to any WiFi enabled devices using the Mobile Hotspot feature. Enable the mobile data on your Moto G.
Check the Mobile Wi-Fi hotspot to enable WiFi Hotspot. Tap to Set up Wi-Fi Hotspot. Enter or Edit the Network SSID, Security Type and Password according to your wish. Tap Save to save the settings. Moto G and Moto G 2nd Generation are the best priced well features smartphones available today. The timely Android upgrades, makes this device one of the most attractive phone to buy. I have Aio Wireless ( now Cricket) and I have the unlimited data plan on my Moto G, and there is no path anywhere in settings that allow for tethering and hotspot as on most Android devices. Maybe because Aio is essentially a prepaid service they’ve turned this feature off. Do you know of any third party apps that will add hotspot functionality? Tethering works only with mobile data plan such as 2G or 3G. If you are connected your Moto G through WiFi, then you cannot use WiFi hotspot feature on Any Android smartphones. My Moto G 2nd gen does not have those features. I believe you are speaking about 3rd generation phones and not 2nd generation phones aren’t you? my moto g purchased 2/24/14 had tethering feature. by march 15 or so, tethering feature disappeared as an option. i’m on verizon $45 allset plan. kitkat update happened. motorla says all their phones e3xcept moto g can do tethering. That might be Verizon restriction. The unlocked version of the Moto G comes with tethering feature. You can refer my video for the reference. Yes. You can do that. Just follow the steps given in the post. Do note that, if you are using USB tethering, you need to install the Moto G Driver for Moto G.
I have a moto g first generation, and im trying to recover lost photos. When I click on USB tethering though to try to connect to my computer to fix it, it says that my phone cannot connect to AT&T’s server. ive made sure that the USB cable is connected and that my wifi is turned off like in the instructions, but its still not working. any advice? For connecting Moto G to PC through USB cable, no need of USB tethering. Just connect it and select storage devices, you will be able to access your phone from the PC. For enable USB tethering, you need to buy a plan from your carrier service provider. Kindly send me some details regarding how to connect my moto g2 WiFi to my windows xp laptop. WiFi tethering and USB tethering procedures of both Moto G and Moto G 2nd Gen are same. I am using Moto g2, I have Xp windows, I was try to connect my phone as modem with my laptop using tethering & Mobile hotspot. PC was connected with Mobile but I cant able to access the internet in my laptop. kindly give your valuable suggestion. Please check whether your phone is connected to internet. You can check this by browsing on your device. Also, let me know, whether you are trying Hotspot or USB tethering? You can see or edit the wifi hotspot password under setup Wi-Fi hotspot. In the screen swipe down. You will see the password. If you want to see the password, then select(Check mark) on Show password. Hope this resolves issue. Presently not solved actualy connected to the computer .but i can not use it. I have motog4 plus, but the led is working only when mobile is charged that too powered off. is there any solution to use led for multipurpose for notifications & etc. Hi there all, here every person is sharing these kinds of know-how, so it’s good to read this weblog, and I used to go to see this web site everyday. My hot-spot works for around 15-20 mins and then shuts down on its own. I’m using the Moto G4 plus. Kindly help me with a solution. Have Moto G 2nd Gen through Tracfone and there are no links or tabs or places to click the item you have noted above. I can go to apps and then settings and then to more but the items you list are not there.